Sidchrome tool kits can be logically and easliy built up. They comprise of the most popular tools in the section of the range. If a tool is lost or damaged, you can buy the individual item for quick easy replacement. Sidchrome chrome tools are forged from special alloy steel and heat treated for maximum strength and durability. Sidchrome open end spanners and the open end of combination spanners (up to 32mm or 1 1/4") feature the innovative ANTISLIP DESIGN (ASD). ANTISLIP DESIGN features a locking groove to prevent slippage and knuckle injury. The unique arc design increases surface contact by over 400%. This means increased torque is applied to the fastener, resulting in fewer rounded fasteners, and a much safer jobs. All standard and deep hand sockets and ring spanners feature the TORQUEPLUS fastening system. This unique system allows greater contact with the flats of fasteners, providing greater torque to enable easier fastening. Conventional sockets damage fasteners by concentrating forces on the corners. Sidchrome TORQUEPLUS sockets and ring spanners spread the force over a larger contact area, reducing the rounding off and extending fastener life. Sidchrome TORQUEPLUS sockets are particularly useful on worn or rounded fasteners. Sidchrome tool kits feature: RTC "Real Tool Count" where the only tools that go into a kit are professional quality tools - not piece count boosters! 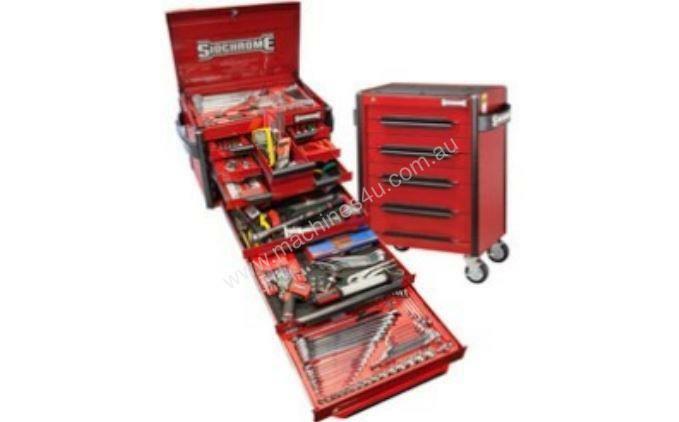 Sidchrome tool kits feature: TSS "Tool Selection Solution" where the majority of your tools have a permanent place in your cabinet. This allows for easy access to your tools. CONTOUR® TOOL WORKSHOP 594 PIECE 1/4, 3/8 & 1/2"